The Tranzendesk 55” modern standing workstation from Stand Steady makes a perfect addition to any office, home, or other work space. Tranzend your workspace today with TRANZENDESK 55 inch height adjustable standing desk. This crank to sit or stand desk allows you to achieve so many health benefits! Have more energy, alleviate pain caused by sitting, mitigate the risk of heart disease and diabetes, have much healthier lifestyle, and enjoy your work day! Our Clamp-on Desktop Shelf places your screens at a more ergonomic viewing position without changing the location of your keyboard. It’s extra wide to support multiple monitor setups and/or offer a place for books and supplies. It also helps reduce desktop clutter by opening up some room beneath the shelf for your collection of bobble heads. 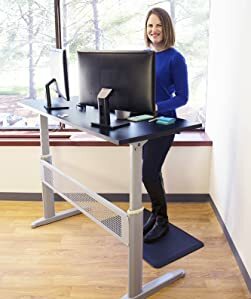 Stand Steady Tranzendesk 55 Inch Standing Desk with Clamp On Shelf | Easy Crank Stand Desk and Attachable Monitor Riser Stand Supports 3 Monitors and Adds Desk Space! Choose your shelf size! 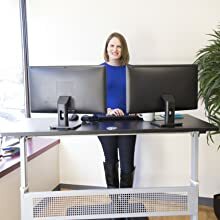 LARGE FULL-SIZE STANDING DESK: The Stand Steady Tranzendesk is a 55 inch full-size stand up desk which promotes increased productivity, focus, and overall health! Take your office ergonomics a step further and set your monitors to eye-level with our customer favorite Clamp-on Shelf and eliminate neck and back pain! 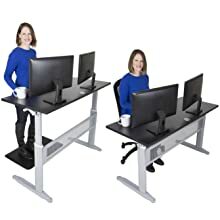 SUPER TALL: Adjustable desk easily transforms from a sitting to standing height with a smooth crank that allows you to go from a height of 29 inches all the way up to 46 inches ; it’s great for anyone up to 6’ 4”! Compatible with most treadmill desks! GET ERGONOMIC & ORGANIZED: Create an ergonomic work space where you can work at your correct sitting and standing height, while using all the items you need. This spacious standing desk fits all of your accessories including keyboard, mouse, speakers, a cup of coffee and more! The clamp on monitor riser perfectly suits multiple monitors while freeing up plenty of desk space underneath! 100% SATISFACTION GUARANTEED: This leader in standup desks has a high quality sleek black surface and silver-gray powder coated legs that ensure years of use. We STAND behind our products! We want to help you have a happier & healthier workday. If you are not 100% happy with your desk, our outstanding team is here to help you! We will happily refund or replace your desk if it arrives in anything less than perfect condition! √ Spacious surface – A lot of desk space on this sit stand desk! √ High quality - Now with an even stronger desktop, you can be sure your desk will arrive in prime condition! √ Attaches to desk in seconds! Desk Height: Elevates from a low sitting height of 29” and has a maximum height of 46"
This was by far the easiest assembly I've ever encountered. The holes all line up so perfectly that you can thread the bolts in all the way with just your hands and then tighten with tools provided. 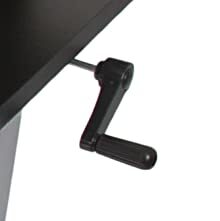 Manual desk crank moves up and down quickly and flawlessly. Plenty of desktop space and feels sturdy enough to last for several years. One minor flaw in the attached shelf out of the packaging. A 1/4" wide by 1/8" piece nicked on the front (toward the person) facing edge of the attached shelf. Outer packaging was not damaged. Minor enough that I didn't feel it was necessary to contact the company for replacement. I haven't had the chance to use this desk yet, because had issue with missing parts when received shipment. One of the boxes was damaged during shipping and was partially open without parts.... currently waiting for the replacement part. 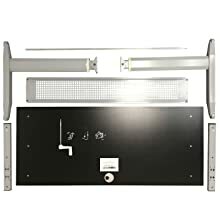 This unit was easy to assemble and took less then 30 from opening the box to using it.The product is solid and sturdy when raised. The hand crank is smooth and easy to raise to a height comfortable for a tall guy to work stress free. The clamp on shelf allows more desk space while provide an elevated place for my laptop and monitors. I was able to attach my power supply to the crossbar and alleviate the wires/cables on the floor. I'm glad I made this purchase after looking at various desk for several months. This is the best value with great quality. So far, the desk has been great. Tranzendesk Crank Standing Desk w/ Clamp On Shelf 55"